Becoming a mom is the greatest pleasure of life. As soon as you get to know that a little life is taking shape inside you, you start reading up on all pregnancy milestones and after the baby is born you wish to track and know about all milestones like walking and talking. As a mother, you can’t wait to play songs for your baby and see them move to the beats in their own cute way. So, you must be wondering, when does your baby start hearing? Well, you would be surprised to know that the baby starts hearing right in your womb. The foetus develops the ability to hear in about 18 weeks of the pregnancy. Isn’t it beautiful? The ears and the earlobes of the baby are formed around the eighth week of pregnancy. After three months, the baby starts hearing the sounds. In the third trimester, the ears of the baby are fully formed and functional when he can hear all the sounds in your vicinity like your own heartbeat, your voice, TV, music, etc. This is why most of the women play classical or spiritual music when they are pregnant. In fact as per the ancient practice of ‘Garbh Sanskar’ it is recommended that women should chant mantras and listen to good religious music since the baby can hear it. After the baby is born, the hearing ability of the baby develops speedily. You can expect the hearing of the baby to be fully developed between 4 to 7 weeks. 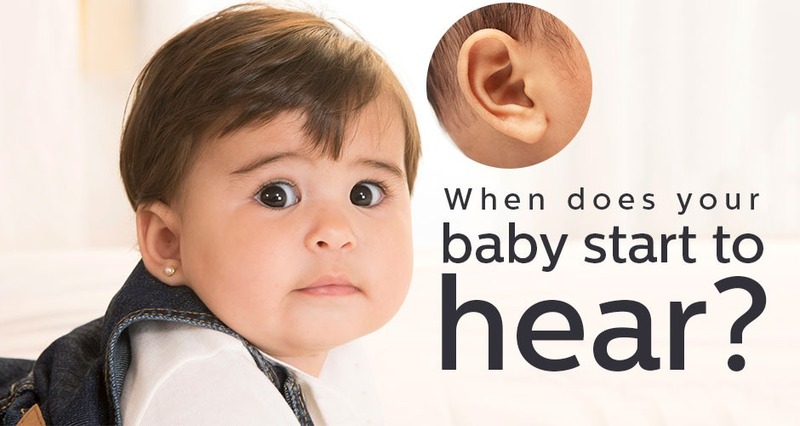 Newborn to 2 months: As a newborn, the baby’s hearing is already developed, however, the baby will mostly respond to high pitched sounds and often to the sound of your voice. The baby may get startled at loud or unexpected sounds. 3 months to 6 months: At this age, the part of the baby’s brain which regulates hearing, smell and language is further developed. Now the baby will react to the sounds. You can try singing a lullaby or talk to them to see if they look directly at you or if they giggle and smile. The baby may also try and respond to what you say. 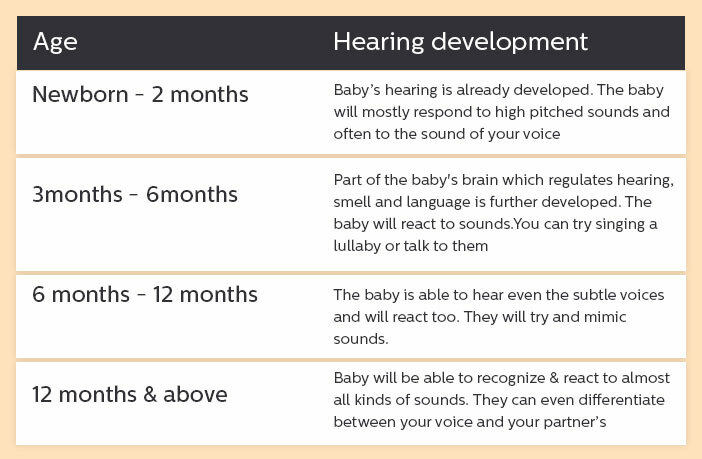 6 months to 12 months: This is the time when the baby is able to hear even the subtle voices and will react too. You can even expect them to mimic the sounds they hear frequently. 12 months and above – Since the baby is now nearing his birthday, your baby will be able to recognize and react to almost all kinds of sounds. They can even differentiate between your voice and your partner’s. The babies may respond better to their favourite song or cartoon characters. All the doctors do sound screenings for the newborn babies. If the baby hasn’t responded well in his auditory screening, you can observe the reaction of the baby to sounds at regular intervals at your home. If the baby is continuously lagging behind the hearing development milestones, you may consult a doctor. Talk to your baby. Even when the baby is small and he may not understand what you say and mean, still you and your partner should keep talking to him. Play good music. Don’t put a very loud music, just play a subtle and relaxing number. If it’s is an instrumental piece, even better. It is known to develop the acoustic senses in the babies. Sing and read to your baby. There is nothing more comforting and soothing for the babies than listening to the voice of their parents. Sing a lullaby or a mild song to him and a story at bedtime to make him calm and easy. Play some musical instrument like piano or sitar. Even a toy version for the baby is fine. Clap your hands. Baby respond well to the clapping sound. If you can dance along, it will be much more fascinating for him. Buy him musical toys. This is also one of the ways to develop his hearing senses. Every baby has its own pace of learning and developing. You shouldn’t be too concerned if your baby is strictly not adhering to the milestones, but you must be alert to observe any abnormality so that you can seek the right medical advice on time.